For other Bonn routes, see Route List. 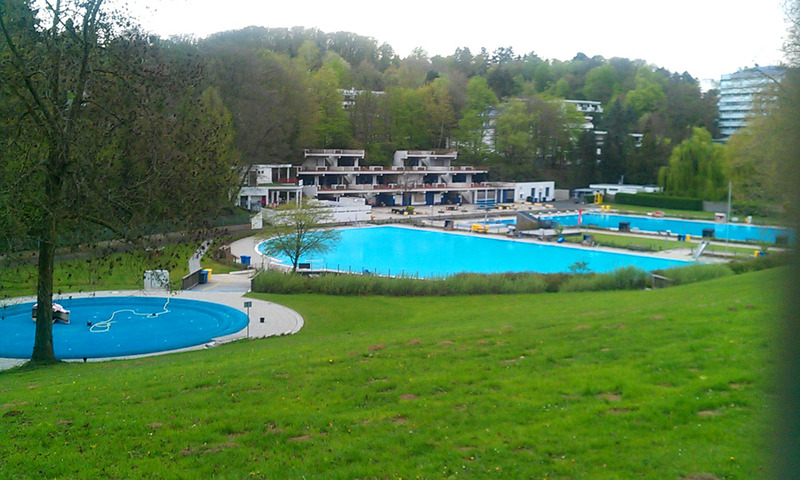 There are some low, wooded hills along the west side of Bonn, and they make for a great running area. It's a whole different experience: if you want to get away from the normal town stuff, this is the place to go. During this week's trip to Bonn, I wanted to get back to the Venusberg hill, still vividly remembering the experience 25 years ago: there was an eerie, spooky woods full of twisted, haunted-looking trees along the eastern slope. I had only experienced something similar just once in my life: a stand of old, hollow oaks in Richmond Park, in London. So this time I planned a loop that would take me back there, but this time adding some other dimensions to the whole run: this run combines history, religion, a hill climb and a stretch of beautiful nature all in one. 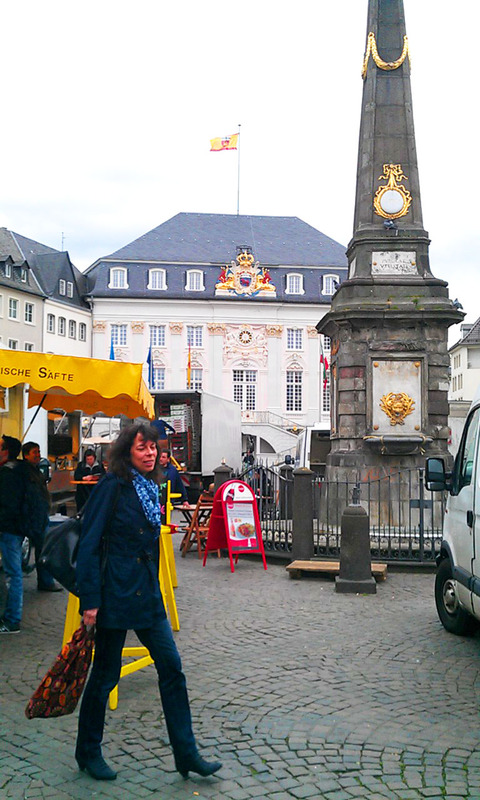 We'll begin at the same spot as the other Bonn run (the River Run), in the old-town market square. It will then head down the tree-lined boulevard to Poppelsdorfer Palace, then follow a pilgrimage route uphill to the pilgrimage church on top of Kreuzberg hill, then head south to Ippendorf village, where you head back along the west flank of the Venusberg back home, running along an idyllic ravine. Unfortunately, there were no spooky trees along that stretch. Standing in the middle of the market, at the obelisk, turn so that the beautiful town hall is to your left. Then run southwest along Marktbrücke (which soon becomes Remigiusstraße). 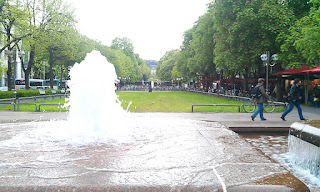 In three blocks, you come to the next square, Münsterplatz. 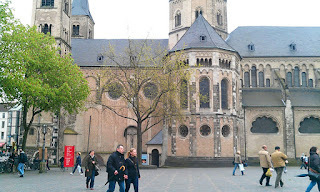 The thousand-year-old cathedral is dedicated to Saints Cassius and Florentius, two Christian Roman soldiers who were executed in Bonn for refusing to worship their emperor as a God. Two gigantic stone heads lying on the ground represent those of the martyrs Cassius and Florentius. Off to the right side, you'll see a statue of an even more famous Bonner: Ludwig van Beethoven. His birthplace is just 2 blocks off to the right. 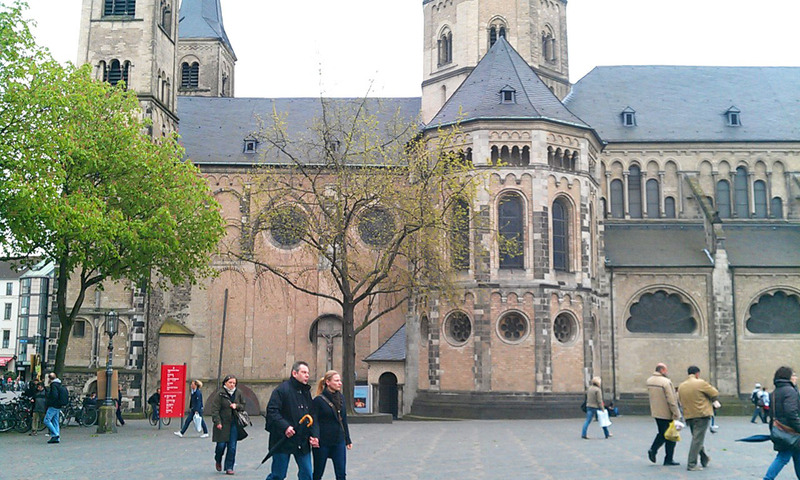 At the cathedral, turn left and run a block along Neutor to Kaiserplatz. 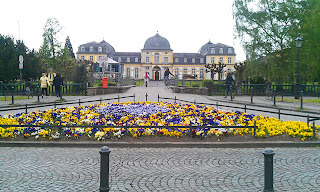 This pleasant square is lined by cafés on one side and is the starting point of a long green square stretching to Poppelsdorfer Palace almost a kilometer in the distance, to the southwest. Turn right and follow the pedestrian way below the train tracks and along Poppelsdorferallee, with its tree-lined lawn stretching to the palace that you can see in the distance. Each side is lined with nice villas. The Kreuzberg hill rising behind it is where we want to head. When you get to the palace, now used by the university, turn right and then left to continue along that side of the palace grounds along Meckenheimer Allee (later called Clemens-August-Straße). Right behind the palace is a botanical garden. After another half-kilometer running along the shopping street, Clemens-August-Strasse, turn right to start running uphill on Wallfahrtsweg. After a block you'll come to a cemetery, where the path splits. Wallfahrtsweg follows the left side of the cemetery and Stationsweg the right side. Both come back together at the top, above the cemetery. Stationsweg is the more interesting path. It is lined by monuments marking the stations of Jesus' path to his crucifixion and his later rebirth. This is typical of pilgrimage paths, which are followed by Easter processions each spring. 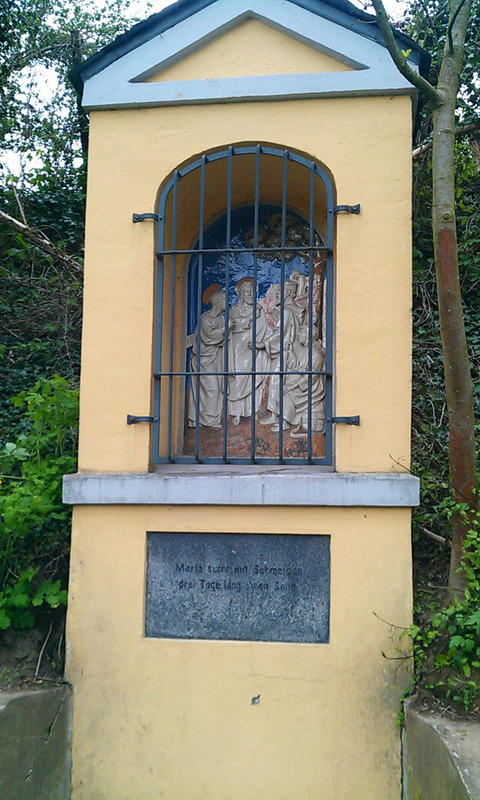 But these stations are different: instead of focusing on Jesus' fate, they focus on Maria's personal tragedy. Either path you choose, this is a hard uphill slog of 500 meters. The pilgrimage church crowns the Kreuzberg hilltop. 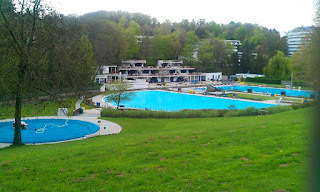 There is a nice view over the meadows to the east to the next, bigger hill, the Venusberg. Its red/white radio tower makes it easy to see for a long way. Pilgrimage church: the clock hands are painted on! Several other paths also radiate out from the church, down the hillsides. Each surrounding village has its own procession path, and the different congregations meet at the top for one Easter service. Turn so that the church is towards your right, and the meadows on your left. We'll now head south on another Stationsweg towards Ippendorf village, just half a kilometer away. In the village, Stationsweg merges into Ippendorferallee, continuing south along the main street through this fairly unscenic village. 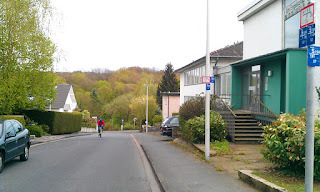 You can see the Venusberg off to the left between the houses, with the narrow, wooded Melbtal valley between them. There is no way across the valley here, you need to keep running for another 400 meters until you can take the first left-hand street, Ferdinandstraße. Ferdinand curves downhill to the right. Right in the curve, turn left at the first chance on Am Engelspfad. Now continue running straight downhill and keep going straight on the pedestrian path when the street turns right. You'll run past the last houses and continue along a dirt path into a woods and the Melb stream. You will see a bridge, where you have a choice: either stay to the left, next to the stream or cross the bridge and go uphill to the first path towards the left. 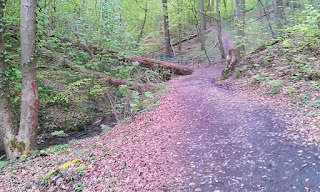 This path also follows the stream, but situated a couple of meters higher, above the ravine. Both ways are scenic downhill paths in their own way. The top path ends after a while, and you have to switchback down to the lower path later. If you take the stream-side path through the ravine, it crosses the stream several times. Whenever you see a bridge, cross it. The stream-side path winds through a beautiful, steep little valley full of fallen trees and burbling water. 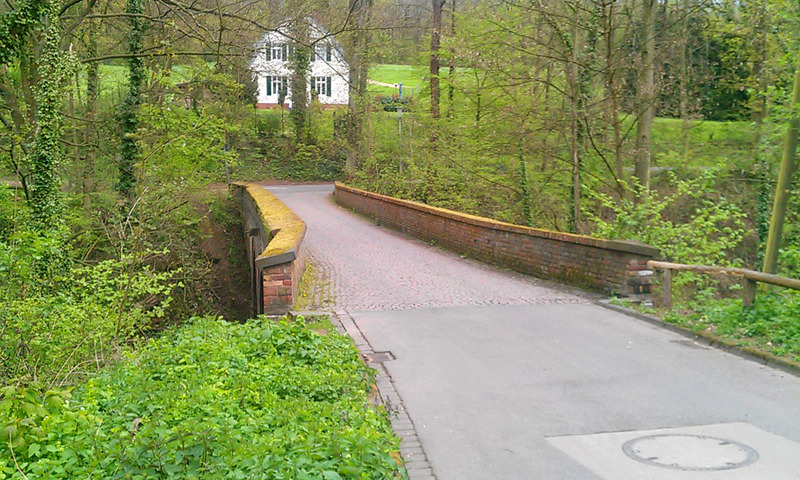 After both paths have come together again, the path runs into a paved street called Melbweg in a little neighborhood in the woods. Turn right here to cross the red-brick bridge over the Melb, and turn left again on the next dirt path to continue along the other side, running downhill above the ravine. Wherever any paths branch off, just stay left. 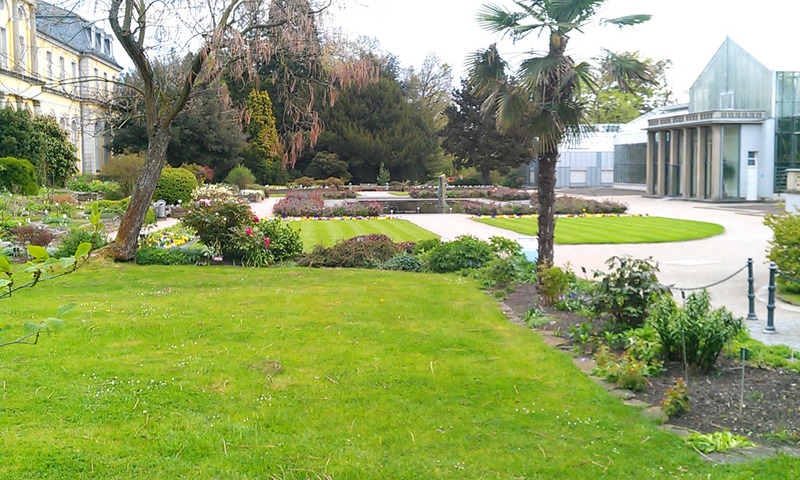 You'll pass another small botanical garden, then run by an outdoor public swimming pool on the left, the Melbbad. On the other side of the pool grounds, the path is paved. 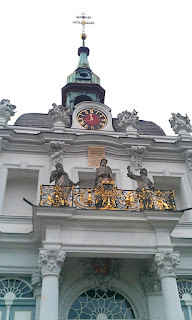 It ends at Im Wingert, where you turn left to run the 50 meters to the main street, Trierer Straße, where you turn right and head back into town again. In two blocks you'll pass the spot where you first got onto Wallfahrtsweg, and you'll recognize it after the street name changes to Clemens-August-Straße. Now just follow the same way back to the start as you came, going by the Poppelsdorfer Palace to the old town.